Voters in the Pine Tree State have chosen to continue using ranked-choice voting in state-wide elections. Jack Santucci explains that ranked-choice voting is likely to be adopted in polarised political environments, creating majorities where there currently are none, and as a reaction to unpopular politicians who have won without majorities of votes. He reminds us that the current era of polarisation is similar to that of one hundred years ago, the last time ranked-choice voting was in fashion. Ranked-choice voting (RCV) has taken America by storm. Endorsements can’t stop rolling in: Larry Diamond, Yascha Mounk, Matt Yglesias, Ezra Klein, The Washington Post, The New York Times, The Economist, and so on. One reason for the buzz is Maine. When its voters upheld RCV last week, they were walking a familiar path. RCV fits perfectly where a majority of people cannot agree on just one candidate, but they all dislike the opposition. Where that happens, conditions are right for a reform coalition to take shape. Also known as ‘instant runoff voting’, RCV builds a majority in a fragmented candidate field. Voters rank candidates in order of preference. If no candidate has a majority of first-choice votes, we eliminate the last-placed candidate, and then reallocate their ballots to the next-ranked pick on each. That process repeats until a winner emerges. In last week’s vote, 54 percent of Maine voters decided to retain RCV. This ‘people’s veto’ overturns legislation passed to scuttle the reform, mostly the work of Republican leaders with help from a small group of Democrats. Two years earlier, in November 2016, an initial referendum on RCV had won with 52 percent. RCV’s appeal in Maine might seem obvious. As Figure 1 below shows, nine of the last eleven gubernatorial elections did not have majority winners. This sort of outcome first emerged in 1974, when ex-Democrat James B. Longley launched the first serious, independent campaign. He won, as shown by the purple ‘I’ for ‘Independent’, with just under 40 percent of votes. Independents of this type have been common since. But why did it take so long to change the voting system? Part of the answer is that few people knew of RCV. It was not until 2011 that knowledge started to spread, thanks to the local League of Women Voters and other good-government groups. Another part of the answer is that the adoption of ranked-choice voting requires polarisation, especially when it happens in a large community. Contrast RCV with proportional representation, which awards seats to groups or parties in accordance with their shares of votes. Say we have three groups: A, B, and C. Say that C controls the government. When A and B team up to enact proportional voting, both A and B can expect to get some seats. With ranked-choice voting, however, A must be willing to lose to B or vice-versa. Like the plurality system it replaces, RCV is winner-take-all. From the perspective of groups A and B, it offers little benefit – unless A and B agree that C is just awful. Polarisation enabled Maine to switch to ranked-choice voting. Thanks to the ascendance of far-right Republicans, most Maine voters now prefer that their governor be someone else. We can see the shift in preferences by measuring voters’ ideologies from opinion surveys, as well as what those voters think their politicians’ ideologies are. As Figure 2 illustrates, in 2012, voter sentiment clusters around the middle of the ideological spectrum. 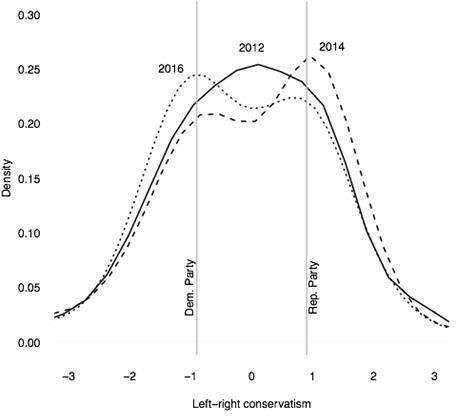 In 2014, most people lean right, with a smaller group of leftists. In 2016, however, the mass of public opinion leans left, in opposition to a smaller mass of right-wing respondents. 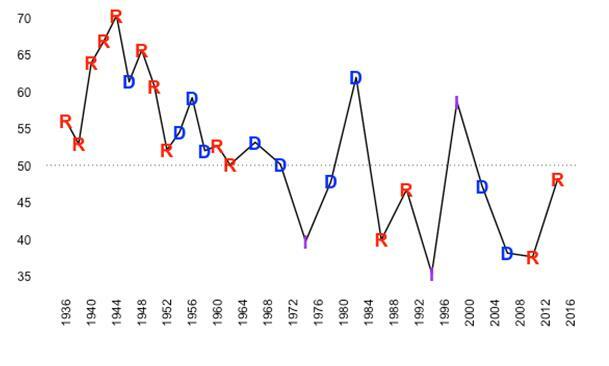 If we added politicians to the graph, we would see just how isolated the current Republican leadership is in Maine. On the left would be the mainstream Democrats, especially those included in the 2016 survey wave. Moving right, we next would encounter independents like Maine’s US Senator Angus King. After that group, in centre-right, would be moderate Republicans like Senator Susan Collins and former Senator Olympia Snowe. Finally, we would reach the current governor, Paul LePage, who is perceived to be more conservative than all but the 2014 US Supreme Court. RCV first captured attention more than 100 years ago. For the North American Proportional Representation League, this was just a fad. For the ideologically committed, however, it solved a real problem. The surge of public interest followed the election of 1912. In that presidential race, Theodore Roosevelt split his party, making Woodrow Wilson the only Democrat to win between 1896 and 1932. Wilson got 42 percent of votes. Had RCV been in place, a Republican might have won. Conditions today are similar in some important respects. First, ranked-choice voting has been spreading since its 2002 adoption in San Francisco. Ten cities now use it, five more will implement, and technical issues delay its use in another six. Second, the 2016 election reminded Americans of what can happen when more than two candidates run for a single office. Above all, though, is that special combination of polarisation and fragmentation. People are running for office in record numbers, particularly on the Democratic side. Meanwhile, third-party candidates have filed to run for governor in three of the four states with developed RCV outfits: Massachusetts, Minnesota, and New Mexico. What polarisation adds is that sense of common enemy. Will vote-splitting cause the election of a candidate that most groups dislike? That is what can galvanise a reform coalition. Or will reform interest shift to proportional voting? If history is any guide, that could be the next step. This article gives the views of the author, and not the position of Democratic Audit. It was first published on the LSE’s USAPP– American Politics and Policy blog. Jack Santucci (PhD 2017, Georgetown University) is a DC-based political scientist. His research covers voting systems in the United States.